There are three different types of cupping: flash cupping, sliding cupping and the regular method, which typically involves 10 cups. There is also dry and wet cupping, the latter of which can often include bloodletting. The treatment is typically used to treat a variety of ailments, such as pain and inflammation, and also to aid in blood flow and help with relaxation. Typically it’s also used as a type of deep tissue massage. Although this alternative method of therapy has been around for an incredibly long time, it has only recently being noticed by the public. Huddersfield’s Deborah Ho, who is newly qualified in this type of therapy, just passed her examinations in cupping. Speaking to her, her passion about this new venture is clear. She easily delves into the various methods, explaining how they began, how each helps, and how they are performed. She has a humanist approach to people and life, and she creates an amazingly relaxing atmosphere. But this is not the first venture she has been on. Every few years, Deborah likes to take a step back and reflect upon what she has achieved in her life, and whether she is happy with it and what she can do to further her experience. As she reflects and discusses with her husband, it becomes clear that one of the things that caught her interest was holistic therapies. 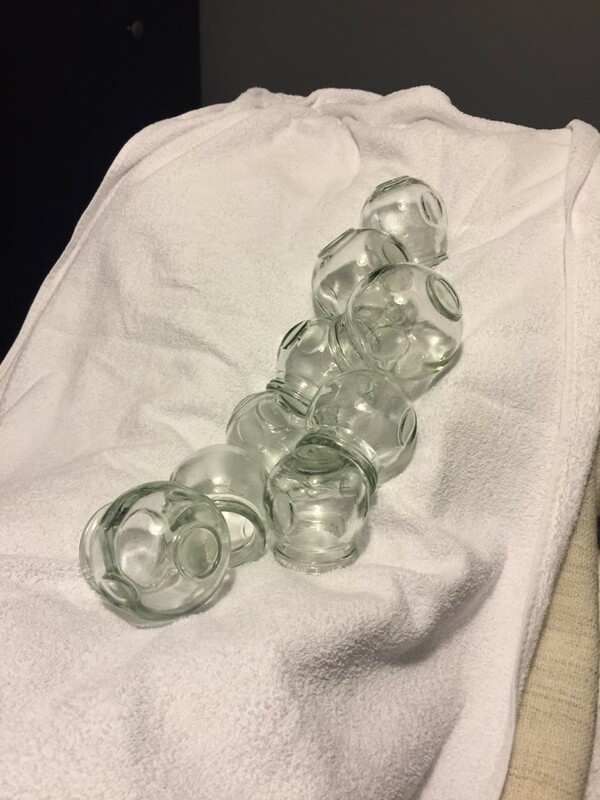 Although cupping is her latest pursuit, in the past year she has also become qualified in Reiki, Gua Sha and Swedish massage. This extensive repertoire is impressive, considering Deborah has only been taking part in these therapies for the past year, while working full time. 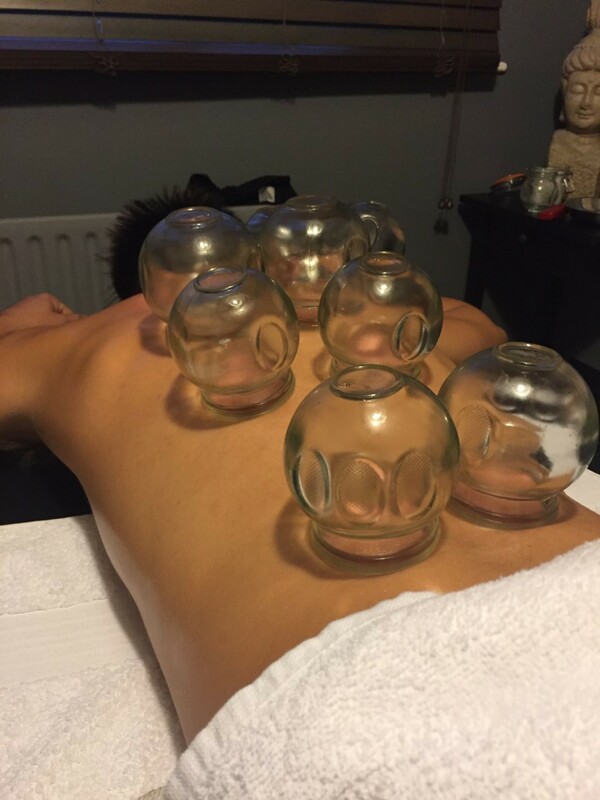 Once all the cups are placed up either side of the spine and around the shoulder blades, they are left on for around 10 minutes to allow the blood flow to continue and aid in relaxation. As they are taken off the back, as shown in the Olympics, there can sometimes be temporary discolouration of the skin. This doesn’t last too long, and only highlights where there has been stagnation of blood . Speaking to the customer after the appointment, he spoke about how the pain in his upper back and shoulder was drastically reduced and how he felt incredibly relaxed. Finally, he mentioned that it was something he would certainly like done again, as a way of improving the pain he often feels when at the gym and work. Overall, after having a small look into this type of therapy, there is no surprise that it is gaining more attention. It is an amazing alternative to the regular massages, or even just as a bit of a treat to yourself. And there is nobody I have met other than Deborah who has such a marvellous in-depth knowledge on the subject and a clear love and interest for helping people. Previous PostFaking It Fans Make Their Demands Known–With DonutsNext PostAlbum Review: Jeff Rosenstock – WORRY. Thanks for this information. Great read!